"This production offers an engaging, original way for children to learn about a Native American hero. Renowned Abenaki author Bruchac has selected interesting facts that reveal how a young boy is transformed into brave Crazy Horse. Narrator Curtis Zunigha is mesmerizing; he sounds as though he is telling an old story rather than reading a book. Zunigha's voice is enhanced by Native American music that weaves in and out while light sound effects (such as the sound of hooves and wind) provide further suggestions of scenes that stimulate listeners' imaginings. 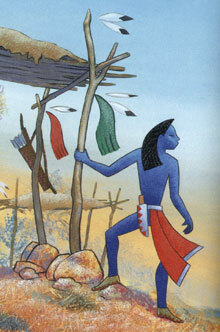 The book's striking illustrations (produced by Sioux artist S.D. Nelson) will draw children in further as they listen with rapt attention." "Joseph Bruchac's excellent picture book (Lee & Low, 2000) about the brave Lakota warrior presents information about his youth. The beauty of the story is not quite realized in the narration by Curtis Zunigha, former Chief of the Delaware (OK) Nation. While richly voiced, he reads Bruchac's spare narrative inordinately slowly and mechanically. Although he may be attempting to convey reverence for Crazy Horse, the integrity of the narrative is compromised by his halting speech patterns. While waiting for the narration to progress, listeners will likely become bored and read ahead on their own. Following the telling, Bruchac picks up the pace when he reads the interesting author and illustrator notes from the original text."